Here’s how to move your domain names to Afternic Premium to take advantage of GoDaddy’s new integration with the service. Last week I shared the good news that GoDaddy is now fully integrated with the Afternic Premium network with fast transfer. This means that you can list domain names registered with GoDaddy on Afternic Premium, which gives you much greater reach than listing domains on GoDaddy alone. If you currently list domain names for sale on GoDaddy Premium Listings, moving them to Afternic Premium is a no-brainer. You’ll get more sales distribution at a lower commission rate (30% vs. 20%). Unfortunately, it’s not as simple as just clicking a button to move your domains. In this tutorial, I’ll walk you through how to move your domain listings. First, you need to export your list of GoDaddy Premium Listings and their prices. Log in to your GoDaddy account and launch the domain dashboard. On the next screen, check the box “List Price (USD)” and click next. The final box will allow you to select how you want to export the list. 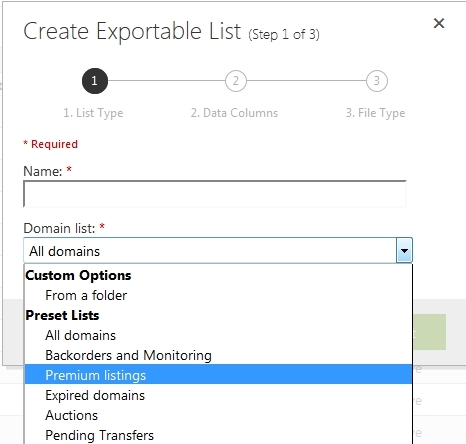 The CSV option will allow you to open the exported list in Excel. After a few minutes, you should be able to download a list of all of your Premium Listings and prices. First, log in to Afternic. Then select “Add Domains” from under the “Portfolio” menu on the left. If you have a small number of domains, just copy-and-paste them into the box on the left, then proceed through the listing process. If you have a lot of domains, you’ll want to use the “Upload a Spreadsheet” option on the right hand side of the page. This step is easier if you’ve never listed the same domains on Afternic before. In this case, download the blank spreadsheet. 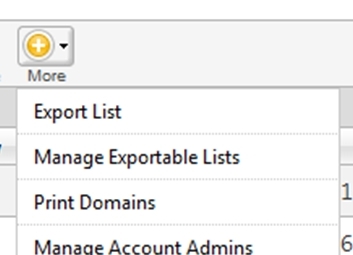 Then, copy-and-paste your list of domains from the GoDaddy Premium export. You’ll also want to paste the prices in the “Buy Now Price” column. Finally, change the “Listing Status” in column K to “3”. Then you can upload your spreadsheet and move on to step 3. If you already have your portfolio on Afternic, you’ll need to download an existing spreadsheet for your account. Unfortunately, even relatively small accounts can’t be downloaded from the interface. You’ll need to contact Afternic customer service and request that they send you your account spreadsheet. Once you get your spreadsheet, you can add and edit your domains. After setting a buy now price, change column K to “3” and upload it back through the interface. You’ll receive two emails after you’ve properly set your domains up with Afternic. The first will come from Afternic, informing you that you’ll have to opt-in with GoDaddy in order for your domain listings to become active. The second email will be from GoDaddy asking you to opt-in. The second email is being sent in batches, and in my experience it can take anywhere from an hour to a day for this email to arrive. This second email will have the subject “Authorize your domain listings” and it will have a link you must click to authorize. Now you’ll want to delete your old GoDaddy Premium listings. If you don’t, your GoDaddy listings will take precedence over your Afternic listings (on GoDaddy.com, but not other sites) and you’ll still pay the higher commission. To delete the Premium Listings, go to the Premium Listings page in your domain control center, check the box for your domains, and delete the listings. Note: before you do this, make sure all of your domains went through the entire process. In my case, I have a number of domains that were recently transferred to GoDaddy. Domains must be at GoDaddy for 60 days before they can opt-in to Fast Transfer due to transfer restrictions. Thanks for posting this info. Much appreciated. But, I was wondering, say you have some name priced up on afternic, that are registered with godaddy. They are just “normal” godaddy names, not premium godaddy listings. Do you know how to get into the full afternic network in this scenario? Again – do you have to go through the rep? You can go in your Afternic account and switch the slider from “network” to “premium”. You’ll still have to approve the opt-in. Great guide, wish I saw it before just deleting my premium listings, only had a dozen or so anyway…I’ve recently listed the majority of my portfolio at Afternic due to the difference in commission rates. I was wondering how you guys price at Afternic? Do you start with buy it now, then price floor/minimum at a certain percentage lower? Do you just wing it? Thanks for sharing. The default min offer is $250. If you get a lot of low ball offers, you might want to increase that. I sometimes put floors on domains. I ask myself what the min. is that I’d be willing to sell the domain for rather than setting a percent of the buy now price.